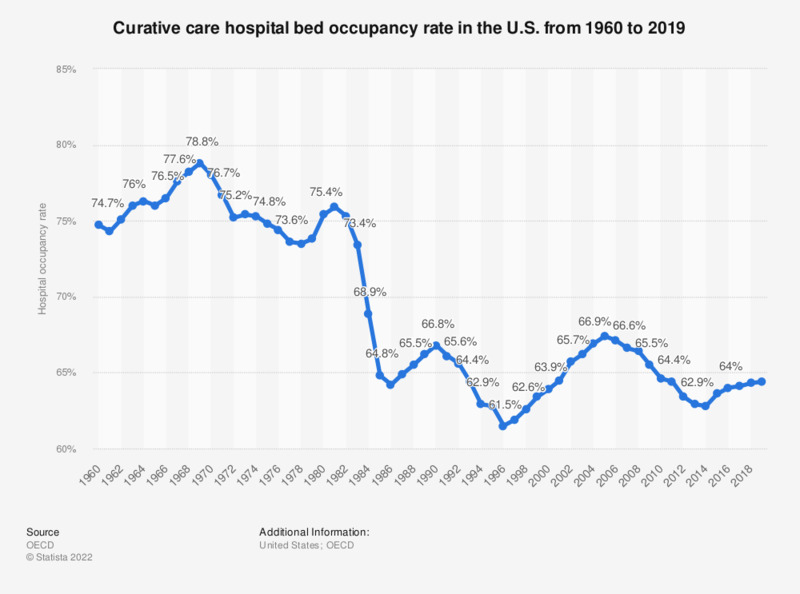 This statistic shows the hospital occupancy rate in the United States from 1975 to 2017. In 1975, the occupancy rate in all U.S. hospitals was 76.7 percent. In 2015, the occupancy rate stood at 65.5 percent. Data are based on reporting by a census of hospitals. This statistic was assembled from several editions of "Health, United States". Estimated percentage of staffed beds that are occupied. Occupancy rate is calculated as the average daily census (from the American Hospital Association) divided by the number of hospital beds. * Calculated based on and added from AHA Hospital statistics, page 8.